Rehearsing for the big square world! "I'm here, laid out in regal splendour, covered head to foot in lard and being wafted by old copies of Time Out!" With typical devilish wit, Andy Partridge, principal of the perennial and quintessentially British pop outfit XTC, greets me by phone from his Swindon, Wiltshire, domicile. Andy is thrilled as punch about the second instalment of his band's "Apple Venus" diptych, called Wasp Star - Apple Venus Volume 2. Last year's first Apple Venus volume saw XTC return to the fray after a too-long hiatus, meeting with universal critical acclaim and much enthusiasm among long-term fans of the group, if not significant sales or chart action in Australia. Andy describes Volume 1 as "songs with the orchestral and acoustic side to it, songs like ‘River Of Orchids’, ‘Easter Theatre’, ‘Green Man’, er, sheesh, ‘Last Balloon’". The album proved itself a unique masterpiece of pastoral splendour - a collection of lush, whimsical chamberpieces. "We said, ‘look, let's make that Volume One, and as soon as we can, we'll start work on the electric material’". So now comes Volume 2 ("it's great to get our hands tangled up in electric guitars again!") Wasp Star, with its surreal, vulvic neon artwork and definite attitude, represents XTC's re-entry into the guitar-based power-pop domain that the band long ago claimed as theirs. Mindful of the more traditional pop approach displayed on the new CD, I put it to Partridge that the music at times resembles that of their early days (Countdown-friendly minor hits like "This Is Pop", "Life Begins At The Hop", "Making Plans For Nigel" and "Are You Receiving Me? "), a period when the outfit might have been construed as a kind of ‘punk Beatles’. The bespectacled forty-something reflects: "We probably were at the time, we got kind of swept in with the whole punk thing. I suppose our energy at the time contributed to that, and the fact that we were rather irreverent. But as we got better at songwriting we grew away from that. But yeah, I suppose ‘punk Beatles’ is probably a pretty fair as hell description as anything else that was ever flung at us... and that's having no paper to wipe it off!" That angular, highly melodic musical recipe employed on classic earlier albums like Drums And Wires (1979) and Black Sea (1980) is reprised on Wasp Star, yet the new album's sophistication also echoes the sounds and textures explored on 1992's Nonsuch. The guitars sting and burn, the drums pound, sizzle and puzzle, the exquisitely-recorded vocal parts are lushly layered and detailed; and Colin Moulding turns in perhaps his most consistently inventive and interesting bass guitar performances time and again on this new brace of songs. Lyrically, the grander themes of Volume 1 are generally eschewed this time around, in favour of simpler concerns: the apprenticeship we all serve at school for life's trials and triumphs ("Playground"), wonderment at womankind ("Church Of Women") and the sheer intoxication that new romance brings ("You And The Clouds"; "Stupidly Happy"). "I mean, ‘Stupidly Happy’ is possibly the most moronic thing I've ever written, but it's really appealing!" Andy enthuses, citing the song's relentless descending guitar riff as "the one that Keith (Richards) missed". Andy's long-serving cohort Colin Moulding contributes three charming vignettes of small-town society - tunes worthy of comparison to those of another chronicler of English eccentricity, The Kinks' Ray Davies. These down-to-earth songs: "In Another Life", "Boarded Up" and "Standing In For Joe", leaven the headier concerns of their Partridgian neighbours on the disc. "It's funny", Partridge observes, "I'm the big indoor, bookworm type, and I write songs that seem to take place outdoors. But Colin's more outdoorsy, and all his songs take place in different rooms of the house". 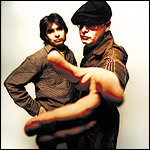 Wasp Star was recorded with producer/engineer Nick Davis at XTC's new purpose-built Idea Studios in Colin's backyard garage in hometown Swindon. "Yeah, Volume 2 started with a trowel and some plaster and a soldering iron and stuff", quips Andy. Guest musicians on the new album include drummers Prairie Prince (ex-Tubes, who also thumped the tubs for 1986's Skylarking and last year's Apple Venus Volume 1) and Chuck Sabo (most recently heard on Natalie Imbruglia's mega-selling debut album). Partridge's daughter Holly provides delightful schoolyard vocal harmonies for the leadoff track, "Playground", and a string quartet adds colour to other songs, notably on the devotional and decidedly McCartney-esque "Church Of Women". The whole album bristles with energy and catchiness, with at least four of the songs being contenders for singles. Nowadays though, Andy is resigned - realistically enough - to a lower profile for the band: "These days I've learnt to become more selfish. I write for myself, and if anyone else likes it, fine, that's a good little thing. I try not to have perceptions (of whom XTC's fan-base is comprised). It could be 15-year-old girls; it could be a 55-year-old Red Indian sculptress or a 30-year-old bank manager... I've no perception of who likes our music and I'd rather keep it that way". Nor are we likely to witness live XTC performances anytime soon. The group has been studio-bound ever since crippling stagefright scuppered Partridge's desire to play live before audiences in 1982. Nevertheless, Andy fondly recalls XTC's well-received concert visits to Australia in 1979/80: "the great short skirts on schoolgirls; and the size of the pubs are ludicrous, like kinda, Kublai Khan had decreed the pub size in Australia!" Hopefully, a short media promotional tour may eventuate in June or July this year, if the band's new Australian distributor, Capricorn Media & Entertainment, can coax the guys out. Neither Partridge nor Moulding is prepared to forecast the band's next step. They have concentrated on clearing the large backlog of material that accrued during their long layoff throughout the 90s (due to a protracted dispute with their former record label, Virgin). The band is now essentially a duo - "a toupee, as opposed to a three-pay" - after long-serving guitarist Dave Gregory quit in frustration during the sessions for Volume 1. Yet Andy for one is keenly anticipating "the blank horizon" that lies ahead after promotional activities for the new album are fulfilled. Meanwhile, Australian XTC devotees and newcomers to their music alike can content themselves with the brand new Wasp Star, the latest example of the duo's consummate pop-rock that brings the band firmly back into the limelight. At that prospect, Andy Partridge whoops with glee: "shoosh, we've got a guitar album coming up next. I can do that stuff!" Amen to that and, er, suggest you crank it up! Wasp Star - Apple Venus Volume 2 is now released on IDEA/Cooking Vinyl, distributed through CME/Universal. [COOKCD 194].